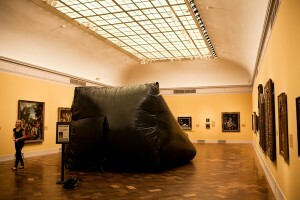 Omar Lopez was the first featured artist at the San Diego Museum of Art’s Summer Salon series on June 2, 2011. In response to the guiding question for this year’s series – “What do cities need?” – Omar showed three interactive installation pieces (HomoHaus, In the Belly of the Whale in the Bell Jar, and Voluntary Tar Pit) which all explore the idea of shelter. City Councilman Todd Gloria also spoke about homelessness in San Diego to a standing-room audience.